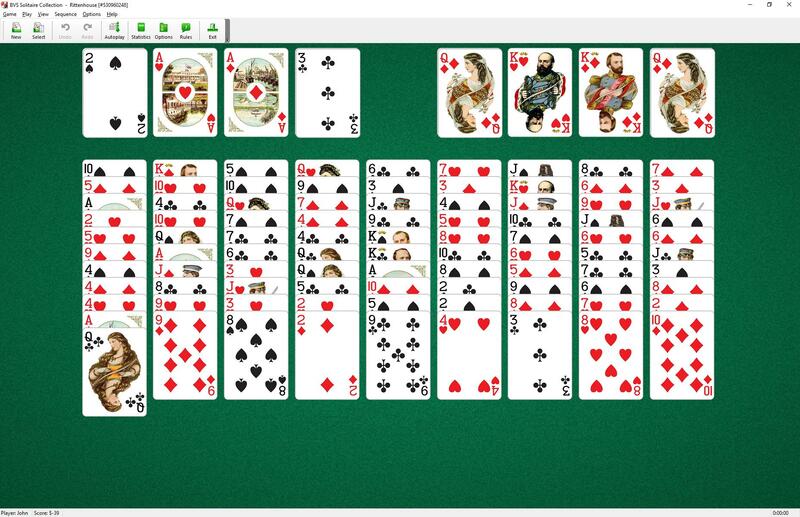 Rittenhouse Solitaire uses two decks (104 cards). You have 9 tableau piles and 8 foundations. An Ace and a King of each suit are moved to the foundation piles during play at the start of the game. 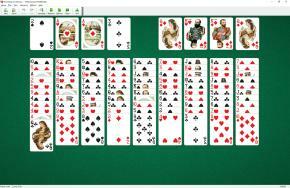 Cards are dealt to tableau and all suitable cards are automatically moved to foundations. Build the aces up, regardless of suits, to kings, and the kings down, regardless of suits, to aces. The top card of any tableau pile is available to play to the foundations directly above it. The top card of central (fifth) tableau pile can be played to any foundation. During the deal, if the card dealt to tableau pile can be played to foundation, it is moved there automatically an then replaced by the next card from the stock pile. You may build tableau piles up or down regardless of suit. Only one card at a time can be moved from pile to pile. An empty tableau pile can be filled by any card. This game was invented by Capt. Jeffrey T. Spaulding.